Marisa Vecchio is the owner of heritage listed Hanworth House, which offers boutique accommodation for women and is also the location for many of Marisa's fundraising events. For her philanthropy and work in the health field Marisa has been recognised with numerous awards including a Member (AM) in the General Division of the Order of Australia for her “significant service to the community, particularly to health administration, standards and accreditation, to education, and to business”. I firmly believe that you are a product of what happens to you. I am a middle class girl who was born in Brisbane and grew up on the Gold Coast. I went to QUT studying music and arts and ventured into business becoming a CEO. I bought Hanworth House, which is over 150 years old, which has enabled me to pursue a new line of business in a philanthropic career. I am a wife, mother, was a company director and national CEO and now I find myself foraging ahead in a world of opportunity that I didn't think I would ever envisage for myself. How did you get the inspiration for what you do? I am the owner and operator of Hanworth House, and the inspiration for that project came from my beautiful mother, Romana, who died of ovarian cancer in 2012. It was a very interesting part of my life in that I had recently stood down in my position as CEO and was looking for a new challenge in the accomodation space when I stumbled upon Hanworth House. I very often think about it as my strongest hour of need when I needed some inspiration to find something new to occupy the cloudy days of my life at that time. I always say Hanworth became my inpsiration and my salvation at the same time and in many respects became a tribute to my mother. Even though she wasn't with me at that time I believe that she would have loved all that it stood for in terms of housing women and women in need for over 120 years of its existence. So much of the house called out to me, and embodies everything that my mother was - classy, spiritual, a good person and a lot of that happens at Hanworth House these days. What has been the biggest challenge that you have encountered and how did you overcome it? Immediately obviously Hanworth was restored for 6 months before it was attacked by an arsonist and 80% destroyed overnight, the night before my birthday in 2013. It was a very challenging time in that it was deliberatly set alight, dealing with insurance companies and lack of cash flow on a project that needed money to get up and running. So there were many moments in that 18 months that we thought that the project lay in doubt and it was only due to the fortitude of my family and friends that allowed us to get thru that very dark period of our lives, to see it open on its 150 birthday jubiallently in 2014. One of the biggest obstacles and challenges I faced is the combination of the death of my mother, fire at Hanworth, death of my father and then the diagnosis of breast cancer. To me, a high performing individual, this was ground zero type stuff. My way of coping with that diagnoses was to live as though I had not received that advice. I am not recommending this strategy but for me it was important for me not to let it ruin my life completely and there was only a few people who knew and I deliberately left it silent till the time I felt I could talk publicly about it - now. Lets just say it changed a lot of things in my life, most for good, but I would have to acknowledge it as one of the biggest challenges ever. What is the one piece of advice you would give to entrepreneurs and business women reading this. I think there is only one thing that has to guide you in the world of business. I firmly believe that the world of business is about making the world and community a better place and unless you can consciously form a business and keep doing that business with a clear conscience, knowing that you are making the community and people better, otherwise there is no point. I was always involved in the not for profit sector but I also believe in not for profit means not for loss, it has to make a profit but at the end of the day profit is about purpose more so than product. It's very important that passion can guide us but passion should be directed where it best fits and serves people best, making communities and the world better. My best piece of advice is to make sure that that is your guiding force, rather than knowing what your profit and loss is at the end of the day. There have been a lot of companies that have started small and been not so productive in terms of profit but ended up being the biggest contributors to national and international good. Tell us something not many people know about you? My closest friends know that I am a complete and absolutely salami fan! The really great Italian salamis, if there is a salumeria in Italy then I'm there. My fiends think there will be a salami buffet at my funeral and just get me into New Farm Deli where I can chose all the salamis that I love, I'm in heaven. What trends do you see Brisbane adopting in the next five years? I think a city adapts to the demands of the people that Iive in it. When I look back to when I was younger in 1988 and when Expo came to Brisbane the whole community came out. People got out of their house, we adopted a cafe culture, we ate out, it was all really new to Brisbane. Now we have so much choice in terms of cosmopolitan aspects of the city due to multiculturalism and a wonderful climate that enables us to get out and seek social and family interaction in an environment that is far bigger than our home used to provide. Brisbane will continue to rise to the occasion. What is our favourite place (be it food, somewhere to relax or thing to do) in Brisbane? I'm a little biased however I get great delight in walking around Hanworth House. If I'm working for Qld Ballet, Mater Foundation, Dementia Queensland or Women's Legal Service it shines. The house has such personality and sometimes I forget what a beautiful place it is except in its solitude when it reaches out to me. I'm very privileged in what it has become and will be, going into the future. My other favourite places include sitting on the river or in the backyard of my house, watching people getting ready for Riverfire, it is so exciting. I love to get a coffee or a glass of champagne and watch people preparing for Riverfire, I get so excited watching the anticipation in the lead up to the event. The view from Marisa's home, over the Brisbane River. 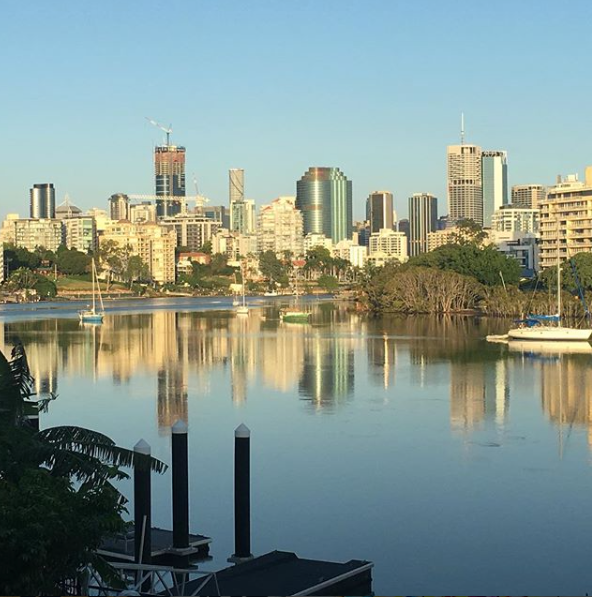 What to you is Brisbane's best kept secret? The ghost stories of Hanworth House. Launched last Halloween and they will be launched again at Open House this year. The Brisbane public have no idea of the ghost stories of Hanworth. We have heard from people who have lived here, worked here, and even I have encountered them. I'm going to challenge the community to think that there are any better ghost stories than the ghost stories associated with Hanworth House. The one restaurant visitors to Brisbane must try? I have 2 favourites, I love the New Farm Deli for breakfast and lunch. I like the food, dedication of great service, hospitality and quality. My grandmother who died last year at 103 used to visit the old New Farm Deli and it is a tradition that has continued from my grandmother. Beccofino for the evening, it has great home style, fabulous Italian food and finished with an ice cream from La Macelleria round the corner, all so close to home. Passion and purpose is more important than product and profit. The second thing that I have been blessed with is the most wonderful relationship with my daughter and there is a wonderful saying that a daughter is just a little girl who grows up to be your best friend. I'm so proud to say my daughter truly is my best friend. I'm vey lucky to have experienced a wonderful sense of achievement and fulfilment in my life. One of the mantras that I have held firm is that we all have the ability to leave a footprint and I love to challenge people and say to them what does your footprint look like? I hope you have enjoyed reading Brisbane's Lady of Philanthropy. Please leave me a comment below and let me know what you think. Sign up to receive Lady Brisbane's weekly love letter of Brisbane sights, events and vintage images.